Even in the winter months the Croatian villages shut down for the afternoon siesta and didn't open up again until almost dark. That made it challenging for us as cyclotourists to find lodging in the daylight hours. A smattering of English, Italian and German are spoken in the coastal communities of Croatia, which makes everything easier for tourists. On this our 4th visit to Croatia in 2008 we decided to crack the code on finding the lodging that suits us best in this country. The hotel quality is generally acceptable but the usual price for 2 in the off-season is in the 100€ range, which was $135-150 depending upon the day. In the off season hotels are likely to provide heat, though the single mid-range option in Rijeka, Hotel Continental, only turned the heat and hot water on for an hour or so in the evening when we stayed there in 2001 and you had to know to ask when that heating window would occur and it wasn't always on schedule. Often these $150 rooms are nothing special and can be tiny with a minimum of amenities. The hotels will usually have a large, perhaps handsome lobby but that's not where we spend our time. In 2008 while looking for non-hotel accommodations we actually looked at 3 hotels in one area. Ironically as the price dropped from 60€ to 37€, the quality went up. The first sliver of a creepy room had 2 twin beds placed end to end; the 3rd was a normal configuration and newly remodeled. So, while our bias was against the hotels, we still checked them out along the way and occasionally had a pleasant surprise. Rooms 'Sobe' and tourist apartments 'Apartman' are Croatia's answer to other country's pensions and B&B's. And in some villages there are hundreds or thousands of these private accommodations--the for us trick was finding the good ones still open in the off-season. 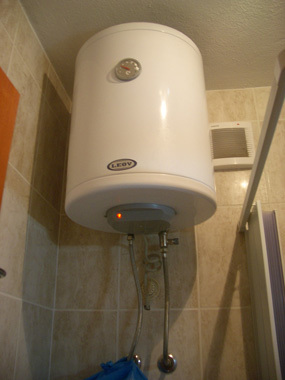 A typical, personal-size water heater. If you do stay in an apartment, you will likely be expected to leave it clean and tidy and provide your own toilet paper and kitchen detergent after depleting the starter supply. And do switch the hot water tank on at the wall switch next to the light switch when you arrive as few heat up in the promised 15 minutes. From our previous visits, we were all too familiar with the 'Croatian Classics' that tended to be dark burrows furnished in the 1970's or decorated in the late-garage-sale style. Instead, we wanted 'Croatian Modern', the rooms that were fresh feeling and bright with natural or artificial light and perhaps a touch of color. These were the rooms we could relax in and enjoy instead of deplete our good humor enduring them. We'd suffered through our share of grim rooms in Croatia in previous years and had no need to stay in another one. Private tourist agencies are the proper way to secure sobe and apartments, but that too is challenging. Most if not all of the agencies were usually closed when we rolled into town in the afternoon and might open at 5pm, close to sun down in the fall. And even when we asked for something especially nice we were at risk of being directed to something we rated as shabby. We may have invested an hour from the time we started talking to an agent until we rejected the room and then had to start over again. Plus, the agencies are quite fond of charging a 30-100% surcharge per night for less than a 4 night stay, even in the off season. Instead of using the agencies, we were happier knocking on doors when we saw the characteristic little blue plaque displaying Sobe or Apartman. Often there was no mention of the surcharge when we approached the owners directly and presumably the price was a little lower since there is no fee to the agency. The challenge in each community was finding clusters of rentals to speed the shopping process and learning to spot the markers for the quality we wanted. In doing this, we had to sacrifice our preference when traveling in Europe for being in the heart of the old towns and close to services, like tourist info and supermarkets. However the tourist info offices often were closed for the season and we shifted our routine from to shopping at the end of the day to shopping in the morning on the way out of town. That meant carrying more food weight during the day but the pay-off in being able to stop where ever we found nice lodging instead going on until we found a supermarket enhanced our lodging contentment and more than compensated for the weight premium. There was often little lodging in the old towns and it tended to be quite expensive in the hotels or rather shabby in the private abodes. In 2008 we slowly developed a fairly reliable system for finding the cluster of tourist lodging. We'd look on a tourist map of the village for a cluster of resort hotels. If we were lucky, we'd pick-up such a map a day or an hour before arriving in the town. If we had no town map in hand, we'd look for tourist info for a map (which were often closed), or a billboard-type map of town. In Croatia we were usually in a coastal village in which the old town was on the sea. The hotel compounds would be beachfront properties on either side of the village. We'd then draw an imaginary triangle connecting the old town and hotel compound and making the third point of the triangle inland in a residential area, perhaps as much as 1-2 km away from the beach. If there was a residential community on both sides of the main road, the discounted lodging would often be on the non-ocean side of the road. The lovely but deeply discounted rooms and apartments were in these inland, less ideal locations for beachgoers but what a value for off season travelers like us. Finding the clusters of rentals is the first challenge, but once you find them you can begin narrowing your options. We generally looked for apartments, which may only be another 5-10€ per night over a room. Apartments gave us 3 features: a kitchen which we thoroughly enjoyed but didn't require; a larger space which we welcomed; and it pre-screened for accommodations in which we would be sharing the bathroom with the family or other guests. In addition to the usual bathing and grooming needs, we needed a sink and some space for washing and hanging laundry and food preparation so we hugely valued a private bath or kitchen. A newer building shifts the odds in your favor that the room will be fresher but it may still have a shared bath or be appointed in late-garage sale decor. Like on the Austrian bike routes, Bill again discovered that selecting places with satellite TV was the simplest way to select for more modern abodes. It is easiest when the sign on the abode indicates 'SAT TV' as many will have it but not advertise the fact. Seeing a satellite dish on the roof doesn't guarantee that the rental space even has a TV however, as the TV may be in the owners quarters only. An old antenna or worse yet, a couple of old antennas, was enough for us to move on. It's not infallible as we had one house to ourselves with an antenna on the roof and satellite TV. We never did see the dish. Looking for places that have SAT TV generally got us a smarter apartment though one has to specifically inquire about English channels if you also intent to watch it. Part of the off-season challenge was finding a sharp looking place in which the owner was in. Phone numbers were rarely posted so if no one answered a knock on the door or "Dober dan" (the Croatian equivalent of "Hello"), we had to go on. So in addition to a well-cared for building with a satellite dish on the south side, we looked for signs of life: an open door, a light on, or someone working in the garden. From this point, finding the lovely room we'll be reminiscing about was largely a matter of luck and perseverance though we usually prevailed. We'd hope that the owners were in and look at rooms until we found what we were looking for or gave in and took the best of the bunch. Often we'd find something in the course of an hour. Sometimes we'd continue on our route and door-knock when we saw something we liked; other times we'd park in a promising neighborhood and take turns ringing the bells. Twice we were still shopping well after dark and once caved in and paid the 100€ for a tiny hotel room when we'd exhausted the few options. One of our early finds was in Pula and it is a good example of the range of options. There we found a newly remodeled apartment for 6 with a panorama of the harbor, a full kitchen, a washing machine, and hundreds of TV stations (including English) for 30€ per night or $40-45 (1€=$1.35-1.50). Across the street for the same price we could have had an apartment that was a maze of disjointed, odd shaped rooms all decorated in the dark, dreary 1970's style. We aren't comfortable bargaining and we pay the asking price if its in our range. Occasionally people have offered to decrease the price went we walked away because we didn't like the space. We learned from past visits to Croatia that we'd have little or no heat in our room though a few places will give you the option of paying extra for heat. With that in mind, we purchased a small, low wattage space heater to take the chill off our rooms and used it about half the nights. The weather was near 70° for our 2008 November tour, whereas in 2001 it was often closer to freezing. Small meant we could pack it on the bike; low wattage meant we could operate it without blowing a fuse. though it turned out that by shopping for these nicer apartments that we usually had heat. Prilaz Puljskih Spanjolkih Boraca 7, Tel: 385 0 52391213, franjo.petrinic@pu.t-com.hr. This apartment for 6 with a harbor view, English TV, heat, and a washing machine was 30€ for 2 per night--our nicest place and best value while in Croatia in 2008. Look for this apartment on the south end of town beyond the old town and past the arsenal strip. Take Tomasinijeva Ulica or Krlezina Ulica to Ulica Verudela near the resort hotel district, turn left onto Cesta Prekomorskih Brigada (opposite the turn to the youth hostel). Take a left again onto Ulica Monte Paradiso and immediately look for the dead-end road to the apartment on your right. I believe bus 2A runs into town on Monte Paradiso. Another pocket of Pula private accommodation options that we didn't explore can be found by turning right instead left onto Ulica Verudela. Turn right off of it onto Luongomare--that's either the name of the road at the junction or the road it takes you to. There is a cluster of rentals before you get to the park area. Near the Roman Amphitheatre, this is the more pleasant of the central Pula hotels. Flavijevska 26, Tel: 541 599. Expect to pay close to 100€ for 2 in low season. Located at Nova Cesta 212 (on the south end of the high road paralleling the coast). It's about 200m steeply uphill from the beach promenade, a 5 minute walk on the public stairways. It's another 5 minutes to the southern cluster of hotels, shops, and the beach scene. Tel: +385 (0) 51 27 27 56, +385 (0) 91 767 12 49. We stopped looking when we found this fresh, modern apartment for 40€. However the 'right on the road' aspect of this apartment would make it too noisy for me in warmer weather--not an issue during our rainy visit. The hostess speaks German and can probably manage in English though Bill negotiated in German. It's about 2.4 km to the Billa store on down the road, about a 30 minute walk. On the same street at Nova Cesta 152, this Villa was 50€ per night. We called the next day though didn't inspect an apartment Tel: 091 144 3888. They said that there was indoor storage for bikes, TV, and air conditioning. The man I spoke with didn't have English on tap but did speak Italian and German. This is an updated, serviceable 2-star hotel and a great value at 37€. We'd stay there again but try for a 2nd or 3rd floor room to escape the off-and-on hum of what seemed to be a motor on the ground floor. No English on the TV but just enough among the staff. In 2008 we stayed at the new and tastefully decorated Pansion-Restoran Maestral on Korzo hrvatskih branitelja 45, a short street at the east end of the pedestrian mall that's uphill a block from the main road through town. We paid 40€ for the room though for 30€ we could have had a large though dated apartment down the road. But that night we happily paid the premium as we were shopping specifically for an abode with English news on the TV to catch-up on the presidential election news. A bonus was heat that we controlled. www.maestral.de; restoran-maestral@ri.htnet.hr, Tel: 00385/51/245911 or cell 00385/91/2117969. Southbound travelers head east out of town and will find a string of rentals on the road for about 3km--until the end of the adjacent village Povile. 40€ landed us a 6-month old apartment for 6 (2 separate bedrooms) with the English TV news we were in search of. The cheery retired German couple speak a smidgeon of English. Look uphill for the orange-sherbet colored building with a */*** apartment sign that looks like 4 stars from below. As you approach Senj from the north, watch for the 45th parallel sign on the ocean side of the road--the apartment is just about in line with the sign. There is no name on "Haus Degen" owned by friendly Monika & Dieter Degen at 53270 Senj Filipa Vukasovica 34; Tel: 00385(0)53882455; dieter.degen@gs.htnet.hr; www.fewo-degen.de. No heat build-in but a dandy ocean view is. A space heater may be available. The hostess' name is something like Dehka Tomhenovic. Spacious, no frills, but comfortable and a steal at 25€. Coming from the north, stop on the main road by the Hotel Zagreb sign, just before the INA gas station on the other side of the road. Cross over to the road above the station and stop. Look uphill to the older white building with red trim, a new 3 story orange building is in the right. The white building with a small 'Rooms' sign is the place. I walked up to it from the main street on a rough path that joined a staircase. To arrive by wheels, take this same road uphill to the right above the station for about 200m, then take the left that goes uphill, and left again to an almost windowless, white building at the end of the road on your left. CNN on the TV. No heat, an efficiency kitchen, ample balcony with a sea view. We would happily stay there again. Tel: +385 (0) 53 694 409 or cell: +385 (0) 98 9766 093. The bright yellow, 4 star Apartman Life on the oceanfront is just beyond the Hotel Zagreb. We've never stayed there but spoke with an American couple who did in 2007 and loved it. Bana Josipa Jelačić, 53288; 57€, was the best of 4 places we looked at though not grand for the price. Tel: +385 (0) 53 694 232; hotel_zagreb@net.hr. If the fruit stand by the Karolbag bus 'station' is closed for the season, ride a little farther into town and look for a fruit store that spills out into the square shared with the hotel as the produce is far superior to that in the main food shop. This is the town closest to the Paklenica national park (about 110 km south of Senj). Look for the apartments on your right, about 100m before the Hotel Vicko (38€/person), which is on your left. It's a 2-storey cube-like building across from the school. Look for it back from the road and down below the main road near the water. For 35€ we had a one room, modern decor apartment with sea view terrace. The satellite TV was tricky: rather than put the TV on 'AV', press '9', then select stations on the satellite box. Switch the Group from Hotbird to Astra to find reception, not just listings, for BBC and CNN. Hotbird radio has NPR! The air conditioning unit will provide heat too. The hostess speaks minimal German and no English though she calls her out of town, English-speaking adult daughter when in a pinch. Beware: we had night time biting mosquitoes for the first time since leaving Istria. We had them in Starigrad last fall too. This looks like a good hotel option closer to the park as it is about 2 km further on from the Vicko, before the the Paklenica Park entrance, near the 3 star Adriana. We haven't stayed here. Located at vl. Marasović Ante-Marin and 30€ for 2, these are pleasant and newly renovated apartments on the main road near turn-off to the park entrance, CNN on the TV in some rooms, free wifi in the lobby across the road at the Hotel Alcan. We liked the brightness of windows on 3 sides that you get with Apt #1 over the garage, not the restaurant, though it gets more road noise that apartments deeper inside the main building. The hosts speak German and Italian; the daughter can manage some English. Check it out on www.villa-lipa.com. From outside Croatia +385 (0)98 9507281. (098 9507281 from Zadar.) Address: Put Dikla 13. mail@villa-lipa.com. An enticingly modern place. The young British couple staying there was very pleased and said they were paying about 35€ a night. Our calls to the proprietress didn't go through or we would have stayed there. It is about a 20 min walk from the old town in a neighborhood labeled as Brodarica on the tourist info map. Look for it on the left side of the road across from a small recreational area. One of the 2 Lidl's (with great chocolate bars) is a 10 minute walk inland towards the Maslina district on Benka Benkovica which roughly parallels the harbor. To find the Lidl from old town, head towards this major street from the footbridge that links the old town peninsula with the mainland then take a left. Elsewhere in Zadar, a large market is located across from the bus station; several mega-stores are located on the main road towards Rijeka. 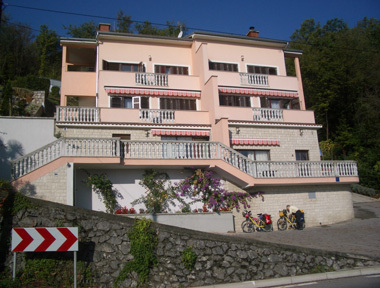 This hotel is at Augusta Šenoe 24, 23210 Biograd n/m; Tel: +385 (0) 23 384 025; www.hotelmeduza.com; 48€. Lovely, fresh hotel 3 star hotel with small rooms, balconies, refrigerators and bathtubs. The soundproofing within the hotel was a little lacking, but the freshness of it was a welcome change. So-so location. The host speaks English and German. We couldn't find any apartments open in late October of 2008 so happily stayed here a second time. The larger Diskont Market is near main road as you leave Hotel Meduza. In 2007 we stayed at a very fresh and modern apartment just out of the south end of town past the mega supermarkets. Turn right off the main road towards the Solaris hotel compound and you'll be on Podsolarsko. Look for the green building, 24A, on the uphill side to your right. You'll have a nice view of the water. Tel: 00385 98 752 552 from outside Croatia. From within, dial it as: 098 752 552. E-mail: goran31@libero.it (I believe this is his son's e-address.) There are other apartments on this road though none were open when we rolled through on the November 1 holiday in 2008. The 'strip city' Brodarica immediately south of Sibenik is also a good place to look for private accommodations as we haven't found any in city itself. Even in early November, a number of them looked open for business. We started looking for apartments about 5 km north of town and came up empty handed. The Astoria hotel at the top of the hill was beautiful for 50€ but 2 days before the presidential elections, we were holding out for English TV. Most private places were closed but the attractive 1 targeting Germans was full. We settled for paying 50€ the lovely 4 star Apartmani Trogir. There was no short-stay penalty. Comfy, close to the old town, and set back from the main road, it was a nice place though more expense than what we'd been getting. There is a grocery store next door that is open on Sunday afternoons unlike most, and a new Konzum about 200m towards the old town. www.apartmani-trogir.com. info@apartmani-trogir.com. Cell: ++385(0)98265397. Tel: ++385(0)21884687,Trogir K.A. Strepinca 78. Next door: 4 star Apartmani Bili @ 78b, Tel: 095 8572 566 looked like a comparable place. There are hundreds of private accommodations for miles along the road southbound out of Trogir. However Trogir is worth a visit so its nice to be closer to town for a visit. We've yet to be willing to stay twice at our previous lodging choices in Split. In 2008 we skipped staying in Split altogether and stayed at Villa Stipe in Podstrana instead, which is located at Grljevacka 3B. It's in a white building uphill on your left as you are heading south on the main road just as you begin another descent. The other half of the building is Villa Dani and it is just before the Hotel San Antonio on the ocean side. It's a bright and comfortable 3 star with a big balcony for some rooms and set-back enough from the road to mute the traffic noise. 40€ with English on the TV, bikes were barely welcome indoors. For a phone number, try tourist info: Tel: 021 333 844; www.tz-podstranat.hr; info@tz-podstrana.hr. Upstairs from this bar are 2 new and nicely renovated apartments with separate bedrooms for 50€. They seemed over priced for Croatia but the building is located in the heart of the old town 1 block in from the main road. Look for the Apartman Mimi sign on the left side of the road as you travel south, just past the Konzum on the corner to your right. The bar is closed from 2-4 pm, which makes that a bad time to arrive. It was a little noisy at our bedtime though settled down not long afterwards. It could be noisy in nice weather. Both heat and air conditioning were available as well as satellite TV with English. Ivana Katusica 6, Tel: +385 021 756-875 or 385 (0) 91 5856551. ante.puljiz5@st.t-com.hr. Look for this apartment at Spiltska 27. It is a modern, 3 storey, 3 star apartment complex with balconies. It has satellite TV selection with BBC but not CNN. The cheery young hostess speaks English. In November 2008 it was 40€ for 2. www.apartmani-brkic.com; info@apartmani-brkic.com; Tel: +385 (0) 21 679 849 or +385 (0) 98 195 63 74. As you are approaching Makarska from the north, turn uphill and to the left just past the INA gas station that is on the right. That's before the place where the road splits into separated lanes and about 1.5 km before the turn-off to the harbor/center, which is in front of the bus station. Turning right and uphill on to Hvarska Ulica, go uphill about 200m and jog left at the Villa Danijel, then immediately right again onto Sv. Florijana, turning left after about 100m onto unmarked Spiltska. There is a small cafe on your right at the corner where you turn left onto Splitska. Look for the pink apartment building with curvy balconies on right right after about 200m. You will have traveled about .5 km from the INA gas station. Located on the main road to the sea side promenade at Kralja Zvonimira 7/A; Tel: +385 21 678 485; Cell: +385 98 264 708; www.villa-rubcic.com; 60€ for large studio apartment #3 with a large balcony and sea view. Immaculate and nicely appointed and plenty of hot water to enjoy the smallish bathtub. Sea view side gets you completely away from the traffic noise. Good beds, good location, and CNN. The hostess speaks English. Definitely our most comfortable abode for 2007 in Croatia though we paid more several times. There could be thousands of apartments in Makarska. We stopped at the first cluster we spotted though there are many closer to the road and easier to locate in the 1.5 km towards the center. I'd look on the uphill side of the main road as the ones we found on the ocean side of the main road were generally shabbier or more expensive. The challenge in November was few hosts were in and most were no longer renting. The only large supermarket we found in Makarska was the Konzum at the south end of town, out on the main road. It's about 4 km from the apartment. It took some looking but we were finally able to find a nice apartment open for 35€ on the upper road through town. An older 3-star place with English on the 'STV' and where the hostess speaks some English. Jadranska 75, just past the turn-off to the center/harbor as you are southbound on upper road paralleling the highway. Tel: +385 (0) 21 697 571. jcagalj@hotmail.com. This a 3 star on the seaside promenade is open all year. In 2008 a room without a view was 60€, room for 2 with a view was 80€, breakfast included. It was our back-up but didn't stay there. We were very sorry to have stayed here in 2007 but we did as it was the only lodging we could find. It was a dreary, overpriced 'comrade' hotel by the port. At 60€ we had a tiny, barely furnished room that made us feel like small children being punished. The classical features of a "comrade hotel" were all there: a bathroom mirror mounted too high for me to see below my forehead; an inadequate shower curtain that allowed the floor to get flooded; a shower handle that had to be held (we call these "one-handed" showers); hot water that is only available for limited hours; small, crummy beds and on and on. In 2008 we bypassed town and continued south on the main road above the port. We noticed that there were about 4 nice looking places offering rooms on the main road just south of the turn-off to the ferry/port area of town, which is where the miserable hotel and a new Lidl are located. A few km on, the upper town flanks the main road. One place advertised rooms at the north end of town. This is a 3 star, at Bernarda Shawa 1, Tel: +385 20 432 654; +385 98 162 0850. www.apartmani-ivusic.hr. capella@du.t-com.hr. Very pleasant, modern decors; the limited windows have a view of the old town & sea; no grounds. 40€ double room, 50€ apartment without kitchen, 60€ apartment. All 3 have frigs. CNN but no BBC on the TV. The hostess speaks English and works elsewhere 'til 3pm. It's a make-do situation with bikes. Close to old town. This is a good choice in the winter months as the rooms are cozy-warm instead of having that unceasingly, damp-chill that many places have. The lack of grounds or balcony make it less inviting when the weather is nice. There are 2 apartments at this 3 star place owned and managed by a pleasant couple who speak English. It's fresh and well maintained with a large terrace area that would be welcome in nice weather. BBC but not CNN on the tube. Our bikes were kept in the garage. There is a 2 night minimum and it is 500 kuna/night for 2 or about 70€ in low season. They are closed from about November until late March. Close to old town at Petra Kresimirea IV 13; kristo.laptalo@du.t-com.hr; 00385 20-427476; cell 098/70 11 70. This pleasant, nicely updated hotel is very conveniently located across the street from Dubrovnik's ferry terminal and the intercity bus station is behind the Konzum grocery store which can be seen from the terminal. It's a dandy location if you are arriving or departing at difficult hours on the bus or ferry. A double room without a sea view in the off season 2008-09 was 76€ and the prices are double this in high season. It's a 2+ km walk to the old town from the hotel and local buses have frequent service to the area.www.hotelpetka.com. A taxi from the port/hotel area to the old town area is about 60-70 kuna or about 10€. I looked at the rooms though we haven't stayed here. It is an acceptable budget option at 125-160kuna per person depending upon the season. The small rooms are clean and well-cared for as is the communal kitchen. Each double room has a newly remodeled, private bath. Two of the rooms have balconies with absolutely stunning views. There are TV's in the rooms but not SAT so it's unlikely that there are any English stations. The real downside for us is the location as it is not on a vehicle-accessible street. It is near the high road that cruises above Dubrovnik at the port-end of town and is only accessible by stairs. We are either loaded down with our bikes or suitcases (we each bring back about 25 kg, over 50lbs, of gear when we return to Europe.) I didn't sort out the bus service for the neighborhood though it's a long walk up the hillside streets and stairs from the sea level roads. I didn't ask but keeping the bikes safe in their private outdoor space shouldn't be a problem. www.hostelworld.com; ivan.nenadic@du.t-com.hr; Cilipska 21/a; 00385 (0)-98-905-1847. This apartment is at Iva Volnovica 11a. This small, bright apartment faces away from the busy street in the Lapad area. Satellite TV, a tiny kitchen and compact bath were a good value at 40€ in November 2008. We didn't stay there but considered it a good option. b_vrtikapa-matic@yahoo.com; Tel within Croatia: 020 332 871 or 098 495 233, the younger hostess speaks English. She said she will give you a lift to the ferry on departure day. The cheery room in the house set back from the street at Zagrebacka 54 north of the old town has a corner kitchen but no TV. The hostess speaks English. 45€ in 11/08. I don't know where the bikes would be stored. A retired Canadian couple were very happy with this hotel that they identified as close to Hotel Leo. A sign to it suggested in was in the Lapad district. It was a small hotel, each room had a private balcony, for about 100€. They found it by wandering around. We rarely eat in a restaurant when traveling, both for keeping our waistlines and our budgets lean. We did over hear an enthusiastic recommendation for the Taj Mahal in Dubrovnik. Find Villa Markoc by turning off the main north-south road towards the sea and following the sign to Cavtat and then 'Center'. Once you see the yellow city limits sign, look for the apartment's street on your right as a short, steep, dead-end downhill. It's the first cross street after a cluster of 3 or 4 buildings and there is a small black and white "Schwartzkopf" sign for a hair salon at the turn. If you come to the little but well-stocked Pemo market on the right, you've gone too far. There are also other apartments on the main road of the upper town before it drops down to the seaside village.